Stick Stack is one of the three 2016 Target-exclusive releases from Wonder Forge – with one release in three main mass-market genres. Stick Stack is the dexterity title while Suspicion fills the strategy needs and Really Bad Art aims at the party game crowd. 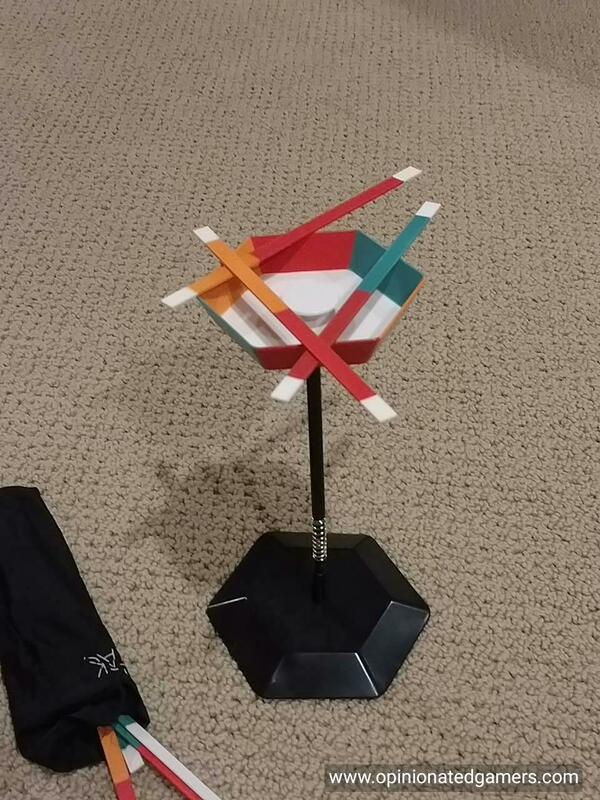 In this game, there are 36 multicolored sticks that are stored in a super narrow bag – there is an elastic cord around the opening that limits your access to only two fingers! 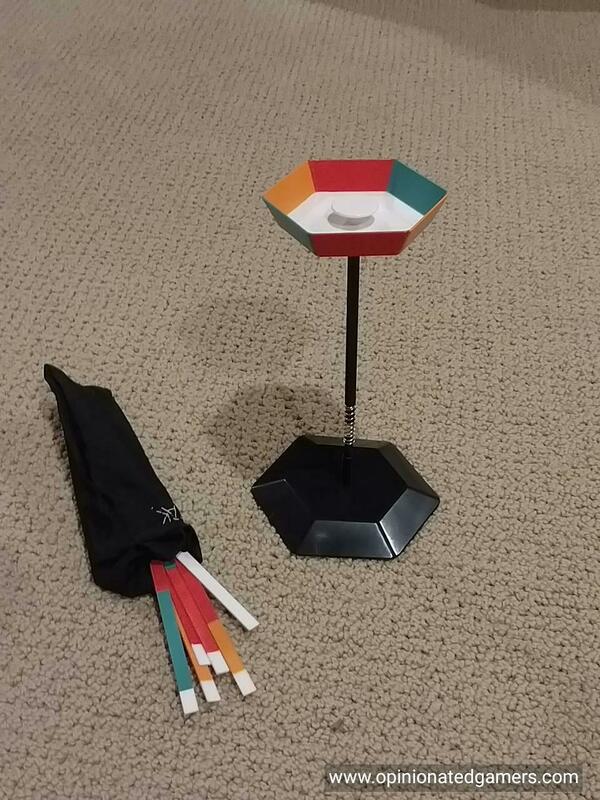 A tower is constructed from a plastic base. A post is connected to the base via a fairly flexible spring. On the top of the post is a larger hexagonal platform. Two of the six sides of the hexagon are colored in red, green and orange. There is a small raised area in the middle of the platform which is white in color. On a player’s turn, a stick is chosen to be placed onto the structure. Usually, this stick comes at random out of the bag. However, if the player has some sticks on the table in front of him (which had fallen down in a previous round), he could choose to place one of these sticks instead. The chosen stick must be placed on the tower so that the colored parts only touch matching colors on the platform or previously placed sticks. Note that white (found on the tips of most sticks) is also a color which needs to match. You may not use your other hand to balance the tower or to touch any part of the tower or sticks. You also may not use your chosen stick to intentionally move previously placed sticks – however, if the placement of your stick causes the whole structure to wobble and thus motion of the sticks, this is acceptable. If a stick falls off the tower during or after your turn, you must collect any fallen sticks and put them in front of you. You can choose to place these on a later turn instead of drawing from the bag. The round ends when either the entire tower topples over, all of the sticks fall off the tower OR there are no more sticks to place on the tower – i.e. all 36 sticks are balanced on the platform. At this point, the round is scored. 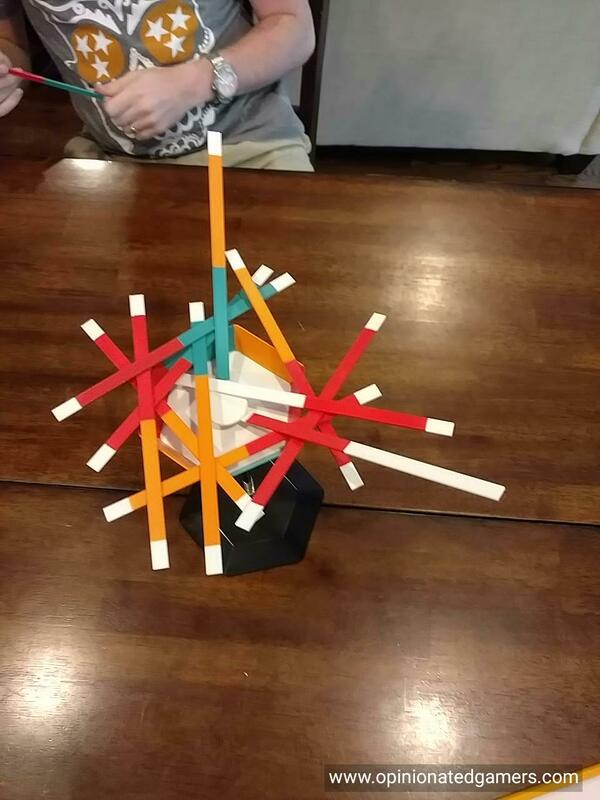 If you caused the tower to topple over, you score five points, but none of the sticks that fell are considered to be in front of you. Otherwise, each player scores one point for each stick in front of them on the table. The game ends at the end of a round when one player has 11 points or more, and the player with the lowest point total wins the game. If no one has 11 points, place all the sticks back in the bag and play another round. 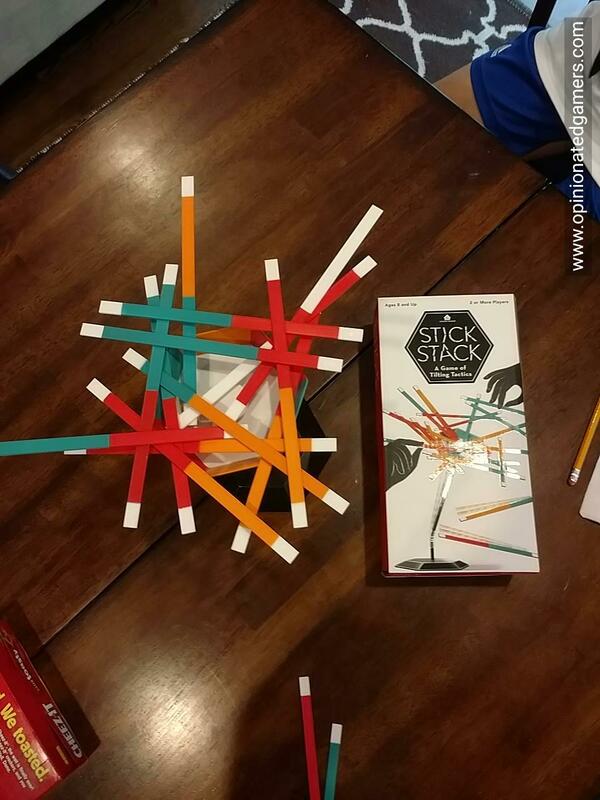 Stick Stack is a simple enough dexterity game. We have played it a few times, and it’s simple enough to grasp the rules. Placing the sticks can definitely be challenging, especially if you draw a stick that does not have a lot of complementary colored sticks on the structure already. I think that we have constructed the tower correctly, but it does seem that we make it to the end of many rounds with all of the sticks on the tower. I do wish that it was actually a bit wobblier as there would be a lot more suspense/sweaty palms/fun if the tower toppled more often. I have noticed that the spring used in the game has gotten a bit looser after constructing/deconstructing the tower a few times, and maybe that will help it move a bit more. We have also been playing on the ping-pong top on my pool table – this may be the exception to dexterity games that turns out to be better on a slightly wobbly card table. All in all, a fun and solid game, but admittedly, I am not a huge fan of this sort of game. The boys like it, and it will remain in the game collection for them. Some of my relative disappointment with the game may also derive from comparison with the other two games in the Wonder Forge collection, both of which I find excellent.